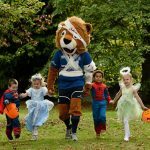 Leinster Rugby has a bloodcurdling evening planned as they take on Connacht in the RDS next Saturday, 26 October at their annual Halloween Thriller event. The Boys in Blue want to secure a win against Connacht and are encouraging all Lilywhite fans to attend the fright night in fancy dress. Scare tactics a plenty have been put in place for those attending the game including a haunted house, trick or treat giveaways, vouchers and prizes for the best adult, family and fancy dress costume! Eerie events will start at 5pm when gates open and game kick-off is at 6:45pm sharp. Adult tickets are priced at €30, children’s tickets €10 and a family of four can gain admission for just €70.